Mind42 is a free web-based mind mapping solution that enables users to create mind maps for projects, events, brainstorming, and other purposes. Developed by Stefan Schuster, Mind42 functions much like Google Docs and Spreadsheets, allowing users to create mind maps within their browsers and work in collaboration with other users without having to install anything into their computers or mobile devices. Mind42 is extremely user-friendly and doesn’t put its users through a steep learning curve. All mind maps are private by default and can be shared easily if and when users decide to make them visible to their colleagues, managers, and clients. Mind42 provides you with a simple mind mapping tool that has the basic features you need to create and share mind maps. Being a web-based browser, you are not required to install any software to get Mind42 running. It functions smoothly on any browser, platform, and device. Mind42 does what a mind mapping tool does – enabling you to build and use mind maps to take note of your ideas and organize them; create an outline for a project or meeting; jot down notes from various members for discussion and collaboration. It is so easy to use and runs well on any browser, which allows for easy collaboration and sharing. Whenever you create a mind map, it is always set as private. This ensures that even when you are working in a web browser, all your ideas and thoughts and other information found on your mind map is yours alone. You do have the option to share your mind maps with other team members or your clients. The best part about Mind42 is that it is free, which is a great choice for individuals, professionals, and businesses that have a limited budget and are still testing mind mapping solutions and see how they can benefit from it. If you are interested in Mind42 it may also be sensible to analyze other subcategories of Best Mind Mapping Software listed in our database of SaaS software reviews. Since each company has particular business wants, it is prudent for them to refrain from seeking a one-size-fits-all ideal software application. Needless to say, it would be pointless to try to find such an app even among market-leading software solutions. The intelligent thing to do would be to jot down the various vital factors that need consideration such as key features, budget, skill levels of staff members, company size etc. Then, you should do your research thoroughly. Read some Mind42 reviews and look into each of the other apps in your shortlist in detail. Such exhaustive research can ensure you reject ill-fitting platforms and select the app that offers all the features you require for business success. How Much Does Mind42 Cost? 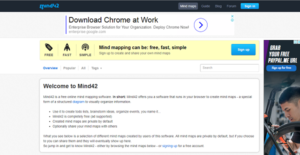 Mind42 is a free software, there are no enterprise pricing plans. We realize that when you make a decision to buy Mind Mapping Software it’s important not only to see how experts evaluate it in their reviews, but also to find out if the real people and companies that buy it are actually satisfied with the product. That’s why we’ve created our behavior-based Customer Satisfaction Algorithm™ that gathers customer reviews, comments and Mind42 reviews across a wide range of social media sites. The data is then presented in an easy to digest form showing how many people had positive and negative experience with Mind42. With that information at hand you should be equipped to make an informed buying decision that you won’t regret. What are Mind42 pricing details? What integrations are available for Mind42? If you need more information about Mind42 or you simply have a question let us know what you need and we’ll forward your request directly to the vendor.